A flexible resin for Polyac® floor screed systems. 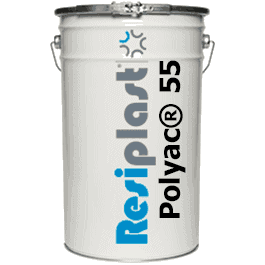 POLYAC® 55 is a flexible, fast curing, floor screed resin for self-levelling floors with a thickness of 1 to 5 mm with smooth or anti-skid surface. POLYAC® 55 exhibits outstanding adhesion and its fast reaction and high reactivity allows it to be used at temperatures below zero. Polymerised POLYAC® resins have high chemical resistance to alkalis, petroleum derivatives, acids, salts and maintenance products. POLYAC® 55 is ideally suited for impact resistant floor finishes, applications on slightly damaged substrates and floors where limited thermal shock may occur.